About 8.2 million people received federally administered payments in December 2017. The average monthly payment in December 2017 was $542. Total payments for the year were almost $55 billion, including almost $3 billion in federally administered state supplementation. The majority were female (53 percent). Fourteen percent were under age 18, 58 percent were aged 18 to 64, and 27 percent were aged 65 or older. Most (86 percent) were eligible on the basis of blindness or a disability. 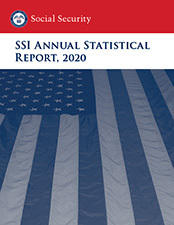 Fifty-seven percent of SSI recipients had no income other than their SSI payment. Of the people receiving SSI benefits, 1.5 percent were residing in a Title XIX institution where Medicaid was paying more than half of the cost. Despite their disabilities, about 342,000 recipients (4.8 percent) were working in December 2017. Aneer Rukh-Kamaa managed the preparation of this report and prepared the statistical tables and narratives. Staff of the Office of Information Resources edited the report and prepared it for publication.